Our first itinerary of the day is getting on the highest peak of Ho Chi Minh City : Bitexco Financial Tower. This is definitely a must in my travel itinerary. 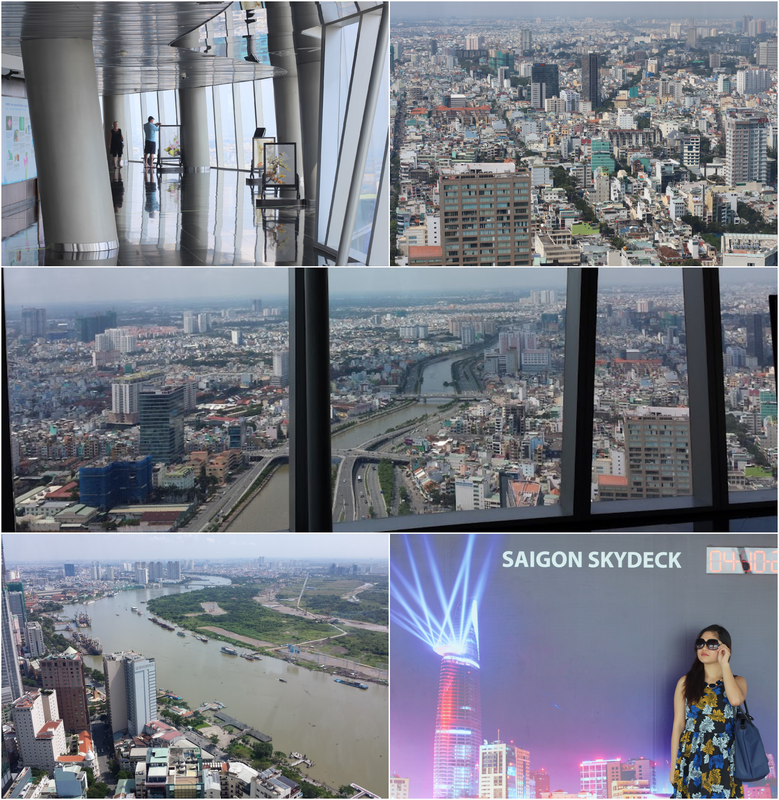 We paid 200,000 VND per person for the entrance to the skydeck which is located at the 49th floor. The whole experience doesn't take more than 30 minutes. 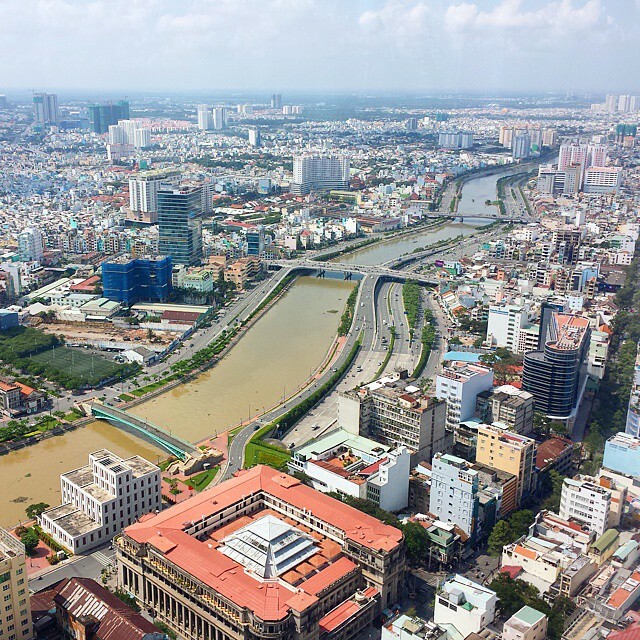 Saigon (Ho Chi Minh City) is pretty, isn't she? Check out more views from my previous post : Bird's Eyeview. 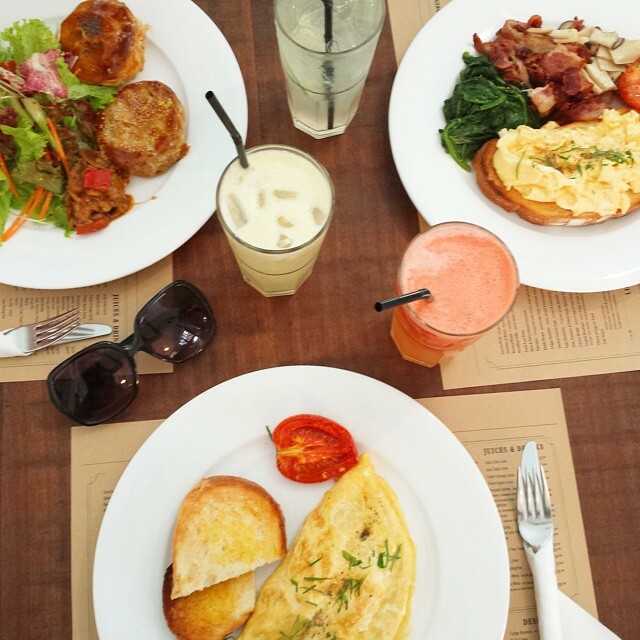 Afterwards, we went to L'usine for brunch. The restaurant is only a walking distance from the tower however it was too hot and we we're already very hungry so we took the taxi from Bitexco Financial Tower. Don't miss out my previous post : Vietnam's Glorious Feasts. We went for western breakfast in Day 2 because my brother-in-law thought it's best for us a take a break from eating too much Vietnamese food. :P The stairway leading to the restaurant is kind of dilapidated, you wouldn't even know that there's a quaint cafe upstairs. It's kind of the stairway in the wet market where my grandmother buys her ingredients for cooking. Sorry, my picture is a bit blurry. Anyway, we love how the place is designed. Thanks to my brother-in-law who've introduced us to this place. Find out more on where to eat when in Vietnam. Check out my previous post titled Vietnam's Glorious Feasts. Saigon's (Ho Chi Minh City) shopping is crazy cheap! 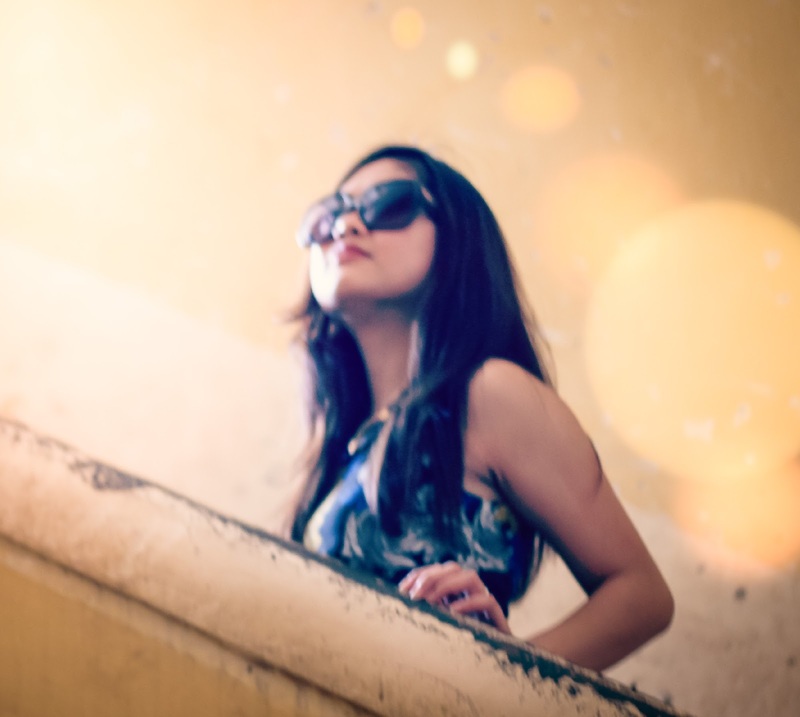 Manufacturer's of brands : Abercrombie & Fitch, Cath Kidston, North Face, Kipling among others are in Vietnam so that's the reasoning behind why these brands are sold super cheap in there. 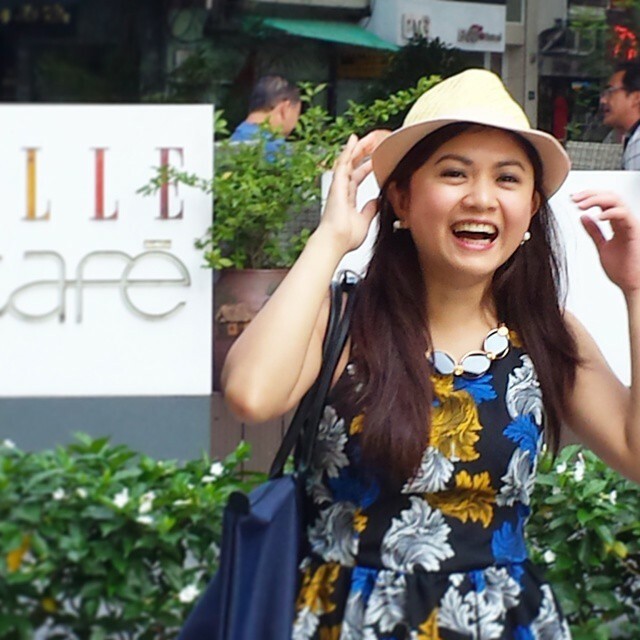 We went to Saigon City Square at Le Loi Street to satisfy our shopping indulgences. And of course, I bought a Cath Kidston bag which is 3 times cheaper compared to buying it in store. You have to take note that these products are not like made in China products wherein they say it comes straight from the manufacturer but still is undeniably fake. So what's my reaction after shopping? It's like this. Ahahah! Okay, I'll try to be more serious here. After our quick shopping spree, me and hubby hurriedly took the cab to the domestic airport for our next adventure which is on Nha Trang! Don't be fooled, cab from Ho Chi Minh city center is just around 170,000 VND but not more than 200,000 VND. Be vigilant! Take Vinasun Group of taxi as they are the most reliable. Oh, hello there Nha Trang! Our plane flight took 40 minutes from Ho Chi Minh, City to Nha Trang. We we're tired and we we're very eager to get to our hotel as soon as possible when we've noticed the taxi meter moving faster than our vehicle. We we're starting to get uneasy when we we're still at the highway still far off from the city and the taxi cost is almost surpassing the dongs we have on our own wallet. When it did, we we're crazy worried. I mean, who would not? How can we pay the taxi driver? All these thoughts are racing over our heads. When we've arrived at the hotel premise, the taxi driver charged us 655,000 VND and we only have more or less 350,000 VND in our pockets. It's super expensive compared to that in Ho Chi Minch City but we're naive tourists who knows nothing about the exact cost of the taxi ride from the airport to the city. We tried to negotiate with the taxi driver and he agreed for us to pay in SGD. Now all our resources are exhausted and we only have 0.0 in our pockets. That's a tragedy when travelling. You are out of nowhere and you are penniless. :'( We wonder why the taxi driver wouldn't go inside the hotel reception as we told him we'll have our SGD's exchanged. Hmmm.. So we asked the hotel receptionist how much is the exact taxi ride cost from airport to the city center and she said it's at 250,000 VND - 350,000 VND fixed price depending on your negotiation skills. What?! No wonder the taxi driver wouldn't come in. But moving on, these things are part of the journey so in the end we've just wholeheartedly accepted what happened as we can't do anything about it anyway. We we're ripped off and that's it. By the way, the ride from the airport takes 20 - 25 minutes and you get to see beautiful seaside and desert views. Find the desert mountain from the above picture. After the drama, we decided to relax a bit at the hotel. In the evening, our stomach started to complain so we went outside and tried to dispense some dongs using our credit card. However, my hubby made numerous erroneous transactions using our credit card so it was locked out by the credit card company. But we didn't find this out until lunch the following day when the cashier from Lousiane Brewhouse told us that our credit card won't work. So how did we survived the entire trip? It is by using our last lifeline which is our debit card. Thank God! For dinner, we just ordered at our hotel and stayed there for the rest of the evening. After all, it has been a long day. never been there, but would love to go!